I know I’ve been away a bit lately, but I was getting over a nasty sinus infection. Now that it’s out of the way I was more than happy to run out back to my normal smoking spot with a Room 101 Farce and Saint Arnold’s Bishop’s Barrel 20. Ever since Matt Booth made a reappearance in the cigar industry waves have been created. Farce is his newest offering making it’s debut earlier this year as a pre-release in the Phoenix, Arizona market before a full release this month. Produced at the Tabacalera William Ventura factory the Farce starts out with an Ecuadorian wrapper over an Indonesian binder packed with filler tobaccos from the Dominican Republic, Nicaragua and Pennsylvania. The cigar is offered in five different sizes: Papi Chulo (4 x 42), Robusto (5 x 52), Toro ( 6 1/4 x 54), Gordo (6 1/2 x 60), and Lonsdale (6 1/2 x 42) which all come packaged in sets of 20. As for the prices I am unsure of most of the formats, but the Toro I am reviewing today comes in at $10.79 a stick. Fox Cigar Bar was kind enough to send a few of these our way for review and were one of the very few select retailers who were chosen to host the pre-release. 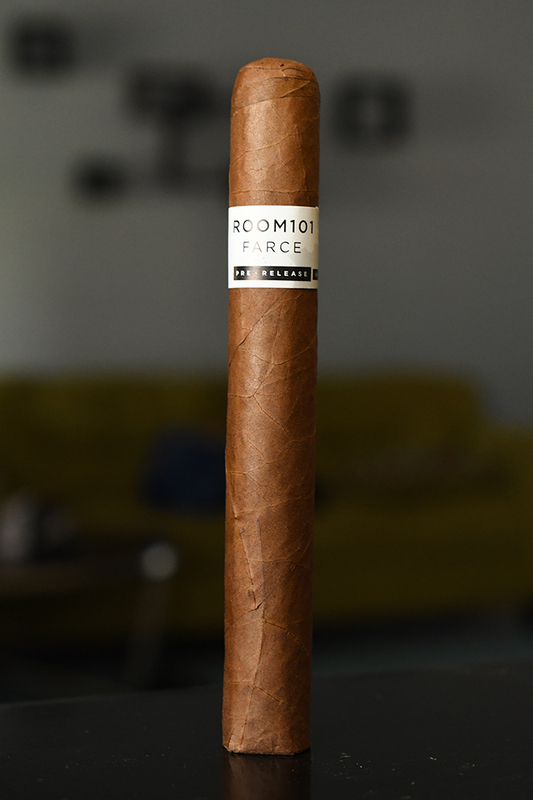 The Room 101 Farce starts out with a beautiful smooth, silky, consistently-colored medium brown wrapper. 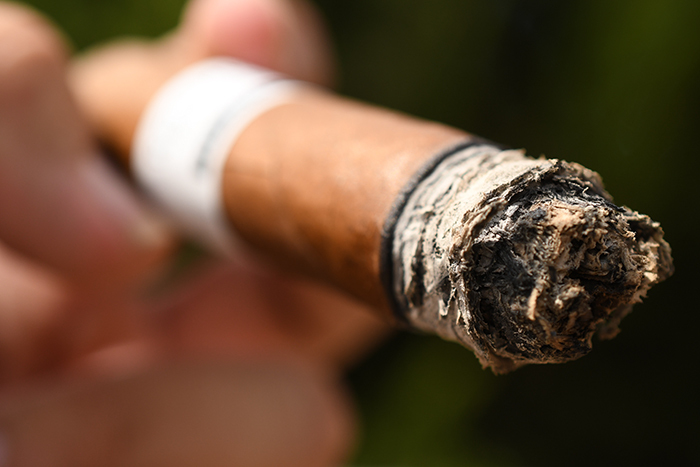 The only discoloration is a few darker areas around the foot of the cigar. The cigar’s texture is very smooth with a good amount of oil. 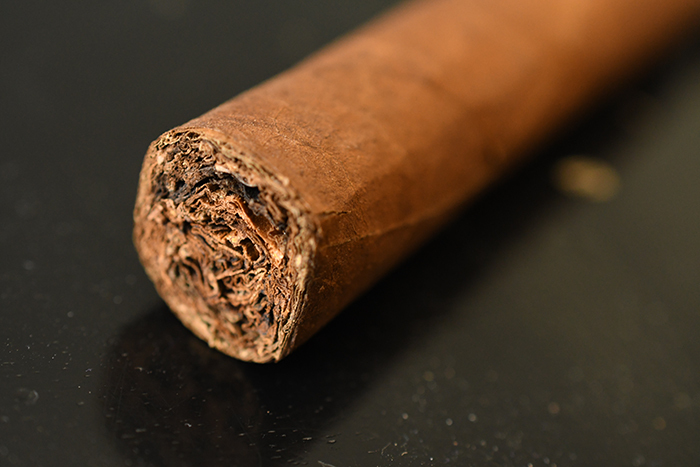 While the wrapper feels very thin and delicate the cigar as a whole is very heavy and tightly packed. 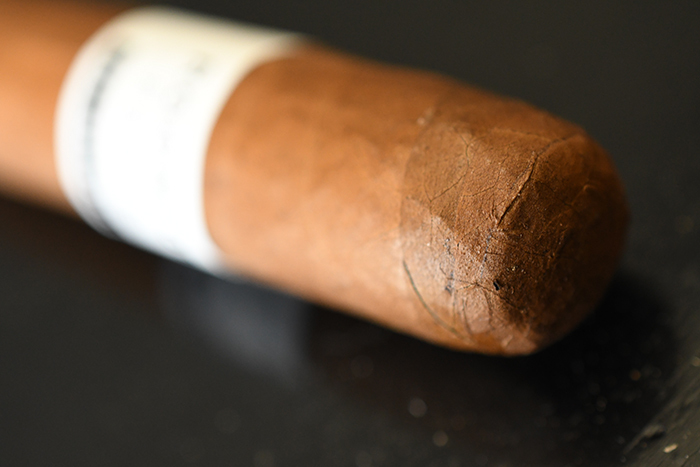 The wrapper carries a few smaller veins leading from through the cigar’s thick body up to it’s round, triple-wrapped cap. 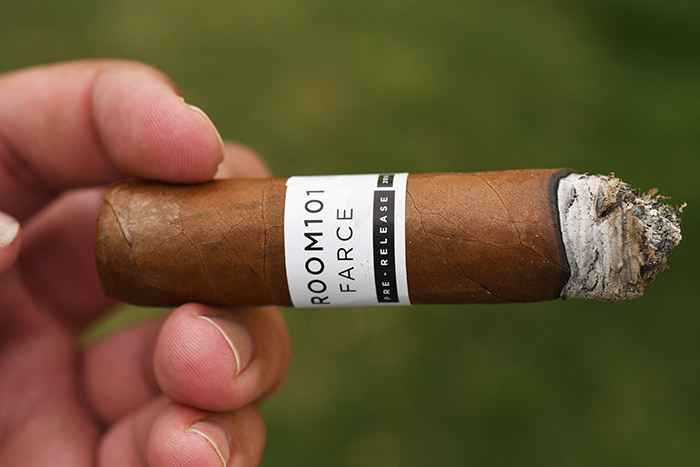 The cigar is polished off with a simple white pre-release band with Room 101, Farce, and Pre-Release written across the front. 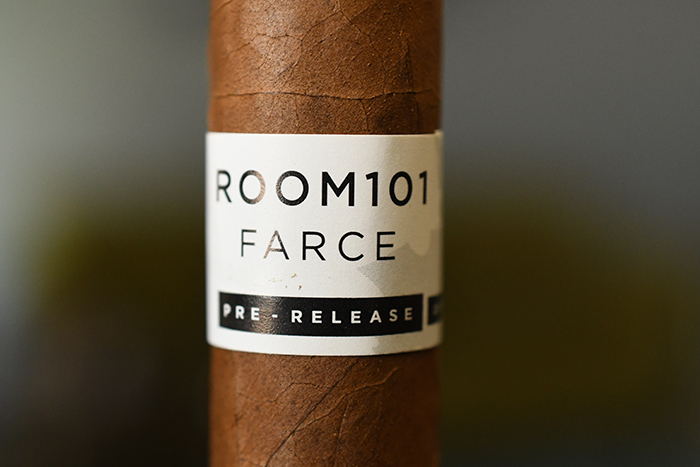 The wrapper on the Room 101 Farce gives off a bold cedar and spiced aroma while the foot of the cigar smells much sweeter with notes of cinnamon, plum, and natural tobacco. The cap cut clean and easily using my Xikar XO double bladed cutter. The cold draw is very oaty/grainy with notes of cedar, plum, and lots of spice. 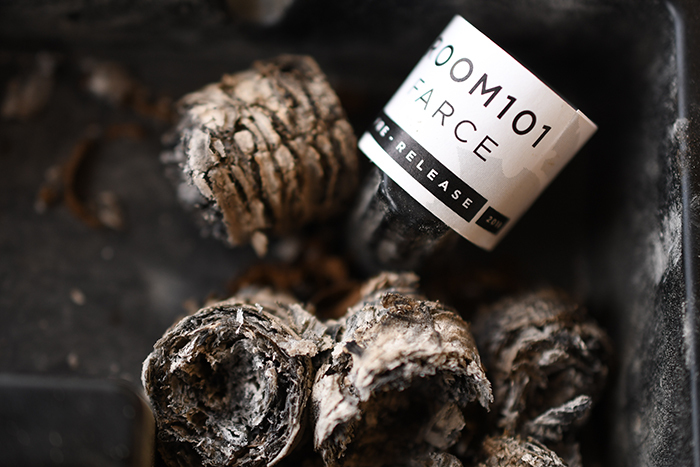 The Room 101 Farce starts out with some nice subtle black pepper notes backed by bold spice, cedar, honey, musk and really subtle floral notes that seem to come and go. The draw is brilliant as each small puff releases a good amount of thick white smoke which dissipates pretty quickly while the cigar itself releases only a trace amount of thin stationary smoke as it rests in my ashtray. The burn line is dead even and razor thin leaving behind a trail of very tightly compacted light gray ash which held one or an inch before giving way. Into the second third of the Room 101 Farce and the flavors are incredible. The cigar is leading with musk and honey backed by spice, brown sugar, natural tobacco, soft pine, and a great floral flavor that keeps peeking in and out. I really dig the flavor profile on this cigar and it’s not one you encounter very often. The retrohale really helps bring out the spice as well as the floral flavors. The cigar is still burning beautifully and I close out the second third with only a tiny little nicotine kick. Into the final third of the Room 101 Farce and the cigar is really ramping up in both Body and Strength. For a majority of the experience the cigar sat in the higher medium range, but is now cresting the top of medium/full. The flavor profile still leads with a ton of spice and cedar backed my a mix of vanilla, honey, pine, cashew and even a bit of the pepper that quickly left the experience in the first few puffs. The cigar took me two hours to take down to the nub and I experience absolutely no harshness nor extended heat but I am certainly feeling quite more of the nicotine effects that I anticipated going into this smoke. I loved everything about the Room 101 Farce. To me, it seemed like the cigar was trying to take everything that is wonderful about milder cigars but with more body and strength. Using Pennsylvania filler was something I haven’t seen done too often before and the result was awesome. The cigar had a flavor profile that was different than any cigars I have had in my recent memory. 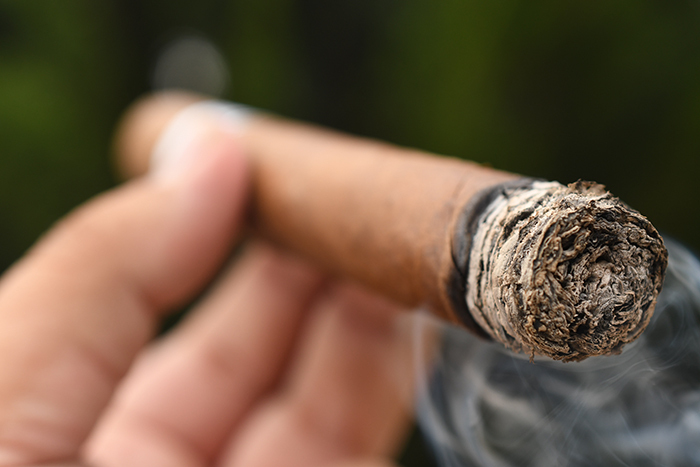 This cigar is perfect for any seasoned cigar smoker looking for something different, and any novice looking for a bolder premium smoke that won’t break the bank. Saint Arnold’s Bishop’s Barrell 20 is a Sorachi Ace Dubbel Aged in Red Wine Barrels with Brettanomyces and Raspberries brewed at the Saint Arnold’s brewery in Houston, Texas. Coming in at 8.5% this beer leads with very heavy raspberry, tartness, caramel, sweetness, honey, and a bit of hop with a very light mouthfeel before finishing with even more raspberry, honey, herbal tea, and caramel. It’s a perfect mix before a sour and and Belgian dubbel and married up with some of the flavors in the Room 101 Farce beautifully while added an extra layer of fruit complexity. 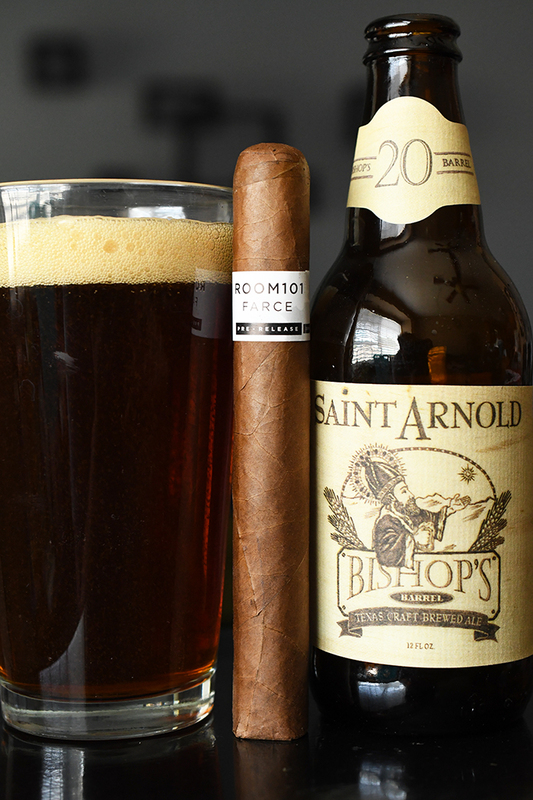 I’d pair this cigar with an Belgian Dubbel or Tripel, Double bock, or some sweetened iced tea.